Published on January 13, 2017 by Martyn. Be the first to comment! 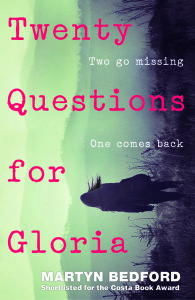 The new year has got off to a smashing start with the news that Twenty Questions for Gloria has been longlisted for the ABA South Coast Book Awards 2017. Also known as the “Amazing Book Awards”, the prize was established in 2011 by school librarians in Sussex and, this year, has more than thirty participating schools along the south coast. Students from Years 9 and 10 in these schools are in charge of choosing the nominated titles and casting the votes, which makes it all the more pleasing to have been selected by my target readership. There are twenty books on the 2017 longlist, including some of the best-known YA authors in the UK: David Almond, Holly Bourne, Sally Gardner, Patrick Ness, Teri Terry and Jenny Valentine. Voting takes place in January to whittle the contenders down to a shortlist of five, with the winner being announced at a special awards event in June following another round of voting. Gold, Silver and Bronze awards are made to the top three books. To view the longlist please follow this link to ABA 2017’s Twitter feed.